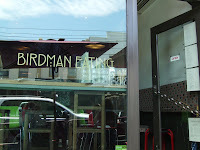 Birdman Eating defines itself with its own font, featured in its logo and on the menu, which can at first glance look like hieroglyphics, until one focuses and discerns many brunch and lunch options. Similarly, from the outside this is 'just another cafe' - wooden tables and padded stools out the front, with a perving bench visible just inside the front window - whereas venturing inside reveals a different story. Chic diners lean against a patterned banquette, resting glasses of wine on darkwood furniture that is definitely not reclaimed. Both menus, however, keep things a bit out of the box. The brunch signature is baked eggs, with four or so variations on the specials board each day (such as caponata, or pumpkin, feta and rocket). Claire over at Melbourne Gastronome has good reports (and links to other reviews) on that dish, as well as photos proving that they actually manage to serve them with still-runny yolks. 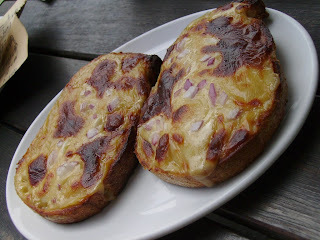 On our visit, the day may have been sunny and our outdoor table rapidly become excessively warm, but I couldn't go past that winter comfort food - welsh rarebit - for my morning tea (a great way to slip in a drink in pre-lunch!). It was enjoyable: with thick-cut bread, crusty but soft inside, and plenty of onion-flecked cheese, but there was a teaspoon or so too much mustard in the mix on each piece. Much more interesting, exciting and refreshing, was the dish served up to my dining partner (cushioned by an old piece of sheet music, no less). 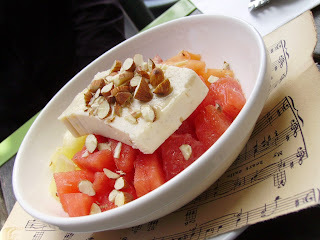 A slab of baked vanilla ricotta perched on a jumble of juicy, delicious fruit: watermelon, rockmelon and pineapple. The ricotta was stunning - firm, incredibly creamy and redolent with vanilla. What a great way to match cleansing and decadence. definitley agree - the fruit salad is the best I've had!! I also tried their baked eggs (with braised beans & fetta), delicious! I believe the font used is a Rennie Mackintosh font from the Arts and Crafts movement. Mmm, beans and feta, a great combo with eggs. Thanks for the tip on the font - I don't know a lot about Rennie Mackintosh but that immediately sounds right.